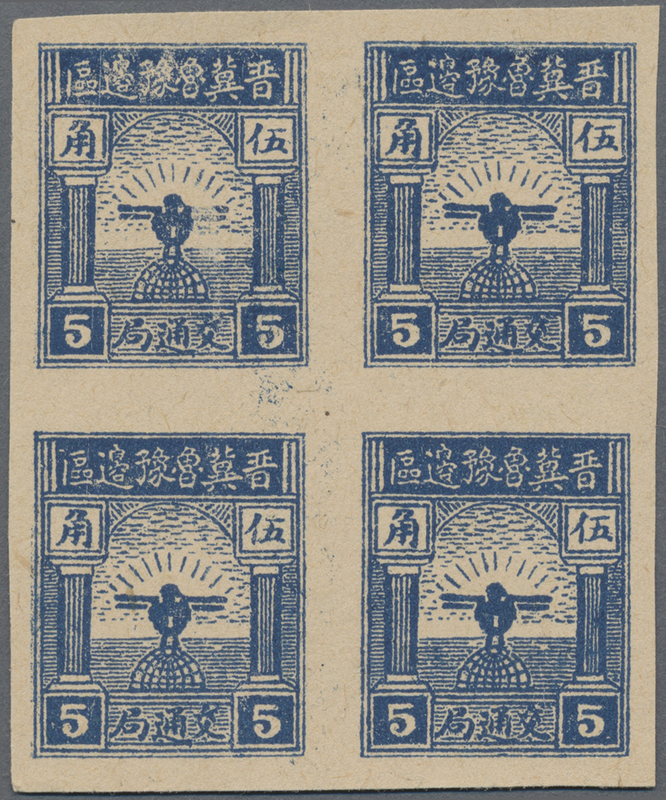 5031 ungebraucht ohne Gummi (unused without gum) (*) 2-3 North China, Shanxi-Hebei-Shandong-Henan Border Region, 1942, "1st Print Postage Label, unshaded Bird", 5c - 10c, unused no gum as issued, 5c cut into design, otherwise very fine (Yang NC161-162). 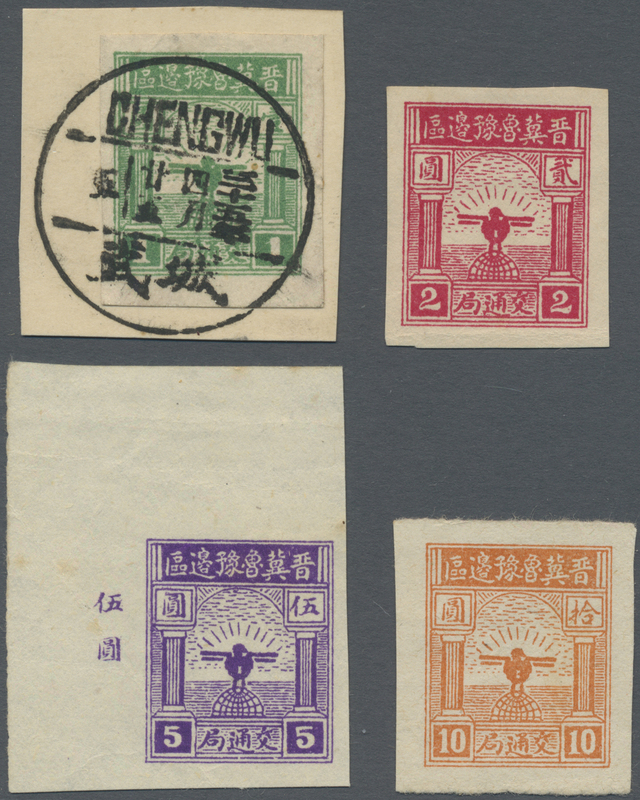 5032 ungebraucht ohne Gummi (unused without gum) (*) 16 North China, Shanxi-Hebei-Shandong-Henan Border Region, 1943, "1st Print Postage Label ovpt. 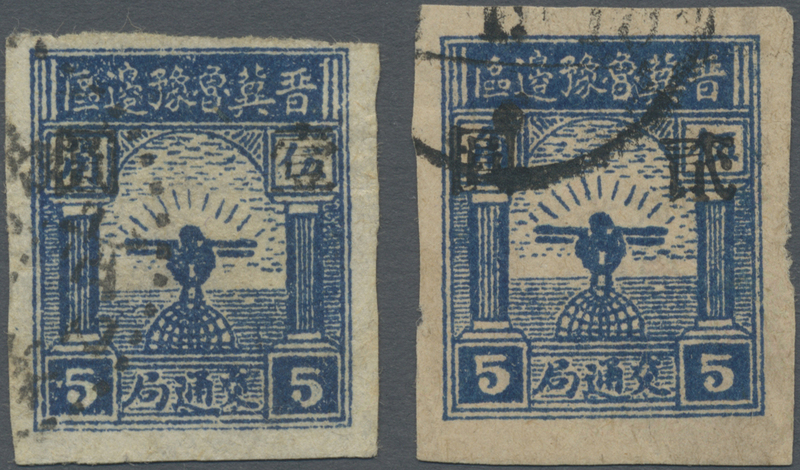 with new value", 5c/10c, unused no gum as issued, very fine, a very rare stamp, less than 10 copies in private hand are registered (Yang NC164). 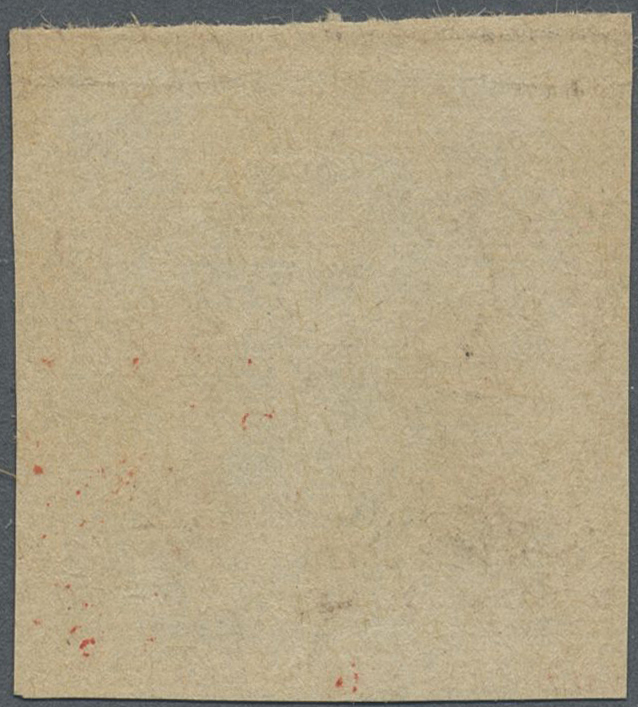 5033 ungebraucht ohne Gummi (unused without gum) (*) 21 North China, Shanxi-Hebei-Shandong-Henan Border Region, 1943, "2nd Print Postage Label ovpt. 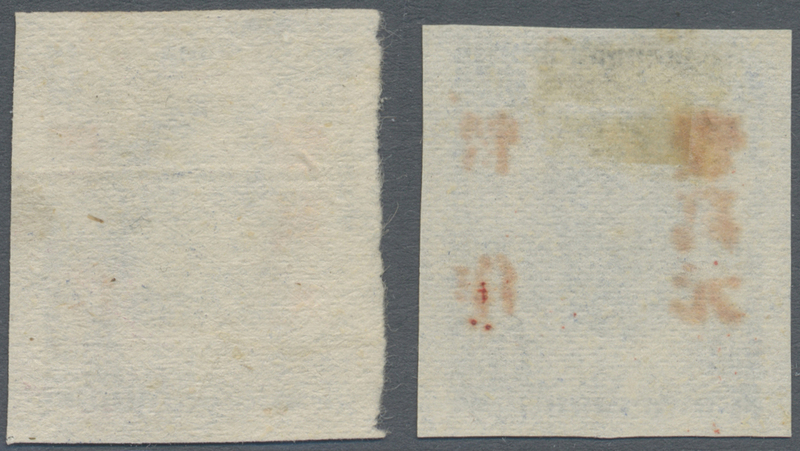 Temporarily Used for", 5c/10c, unused no gum as issued, some tone spots (Yang NC168). 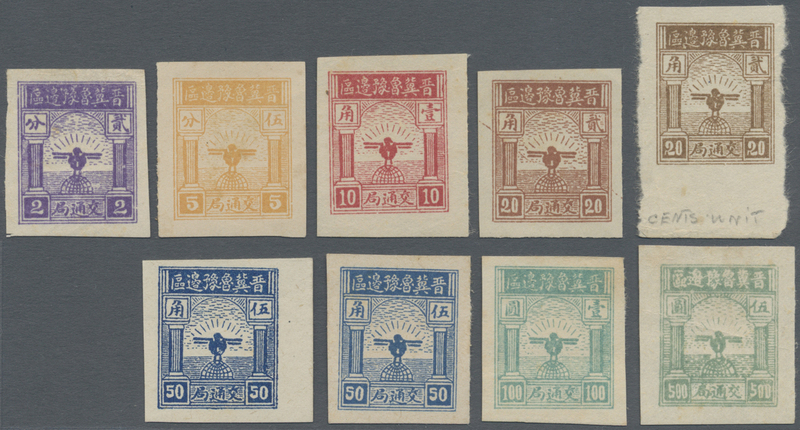 5034 ungebraucht ohne Gummi (unused without gum) (*) 8-14 North China, Shanxi-Hebei-Shandong-Henan Border Region, 1943, "Eagle on Globe (in Fen Unit)", 2c - 500c and two color shades (20c, 50c), total 9 copies, unused no gum as issued, some tonings, 500c horizontal crease (Yang NC170-176, NC173a). 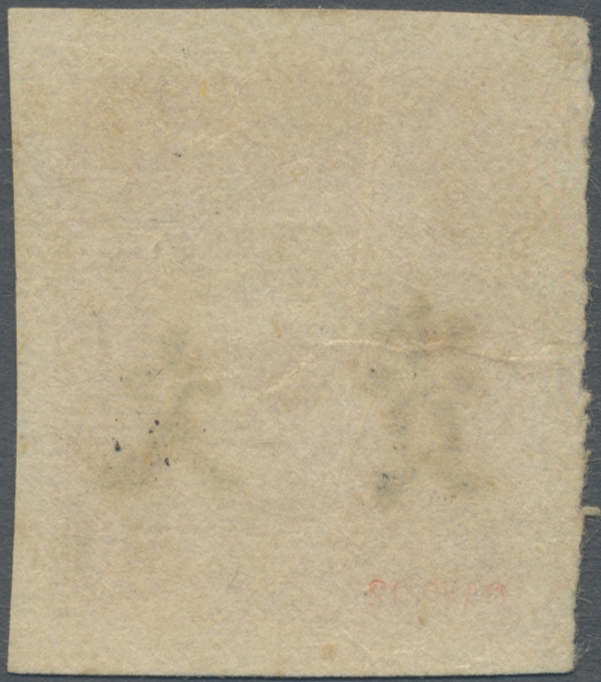 5035 ungebraucht ohne Gummi (unused without gum) (*) 25 North China, Shanxi-Hebei-Shandong-Henan Border Region, 1943, "Eagle on Globe (in Fen Unit) ovpt. 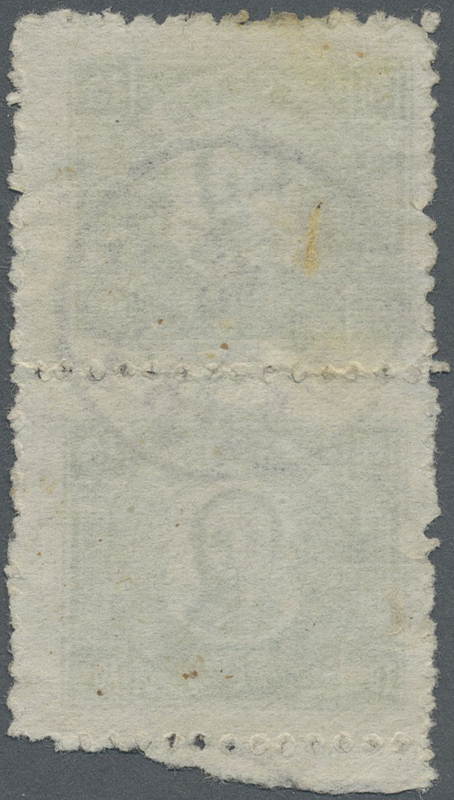 Temporarily Used for" 10c/20c, unused no gum as issued, extra fine (Yang NC177). 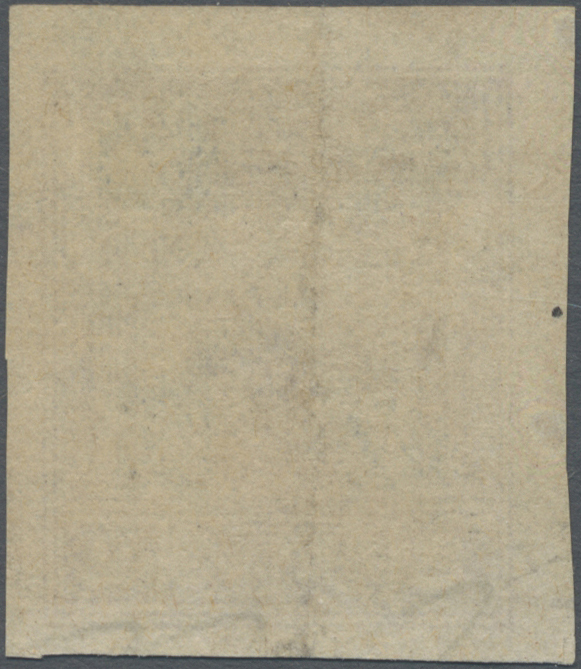 5036 ungebraucht ohne Gummi (unused without gum) (*) 1 North China, Shanxi-Hebei-Shandong-Henan Border Region, 1944, "Eagle on Globe (in Fen Unit) ovpt. 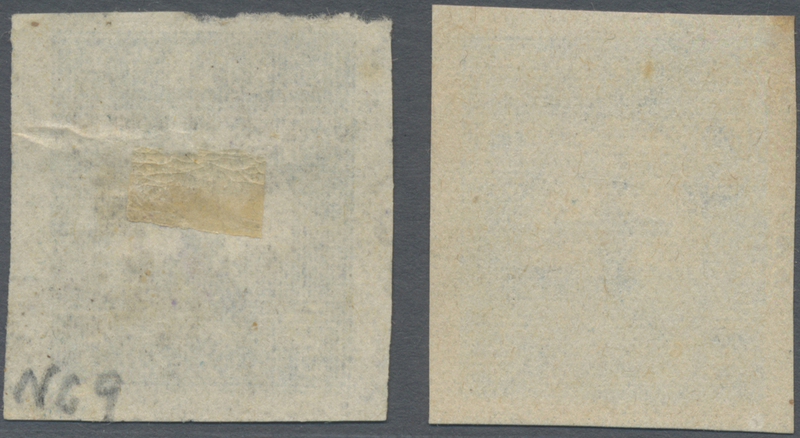 Postage Due", 2c, unused no gum as issued, two horizontal creases (Yang NCD1). 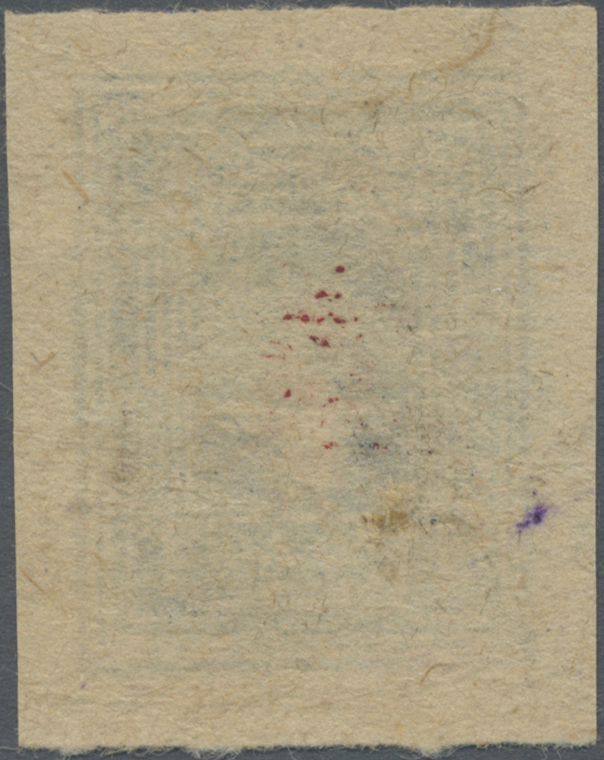 5037 ungebraucht ohne Gummi (unused without gum) (*) 3 North China, Shanxi-Hebei-Shandong-Henan Border Region, 1944, "Eagle on Globe (in Fen Unit) ovpt. 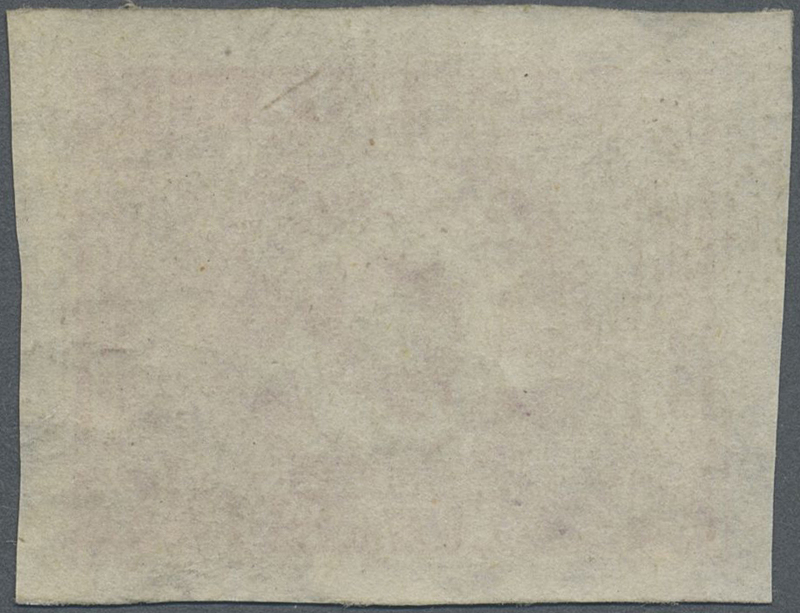 Postage Due", 10c, unused no gum as issued, light vertical crease (Yang NCD2). 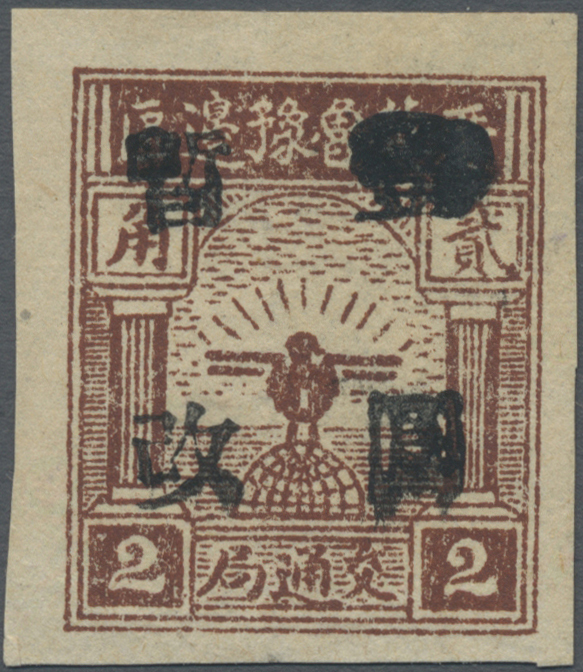 5038 ungebraucht ohne Gummi (unused without gum) (*) gestempelt (marked) 29-32 North China, Shanxi-Hebei-Shandong-Henan Border Region, 1944, "Eagle on Globe (in Yuan Unit)", $1 - $10, cpl. 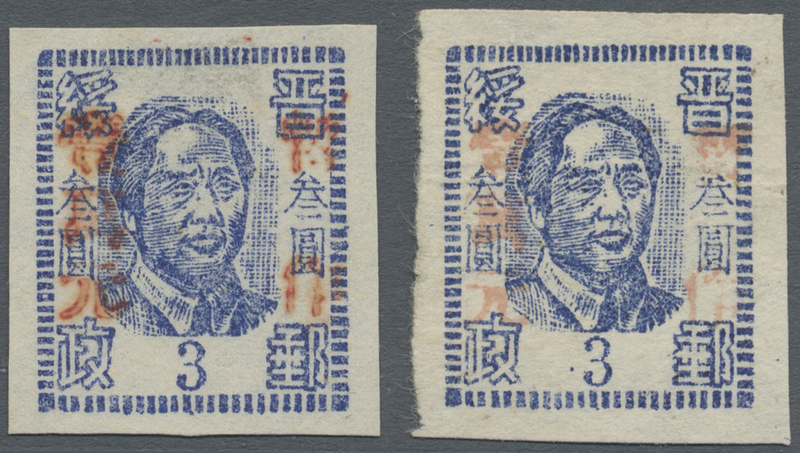 set of 4, $1 used, tied “Chengwu, 25 April 1946” on piece, others unused no gum as issued, 5$ with light diagonal crease (Yang NC183-186). 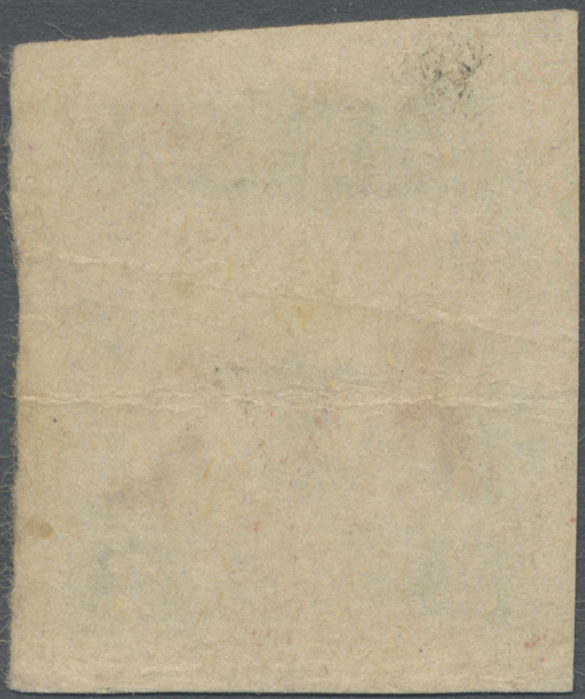 5039 ungebraucht ohne Gummi (unused without gum) (*) gestempelt (marked) 34-39 North China, Shanxi-Hebei-Shandong-Henan Border Region, 1946, "Eagle on Globe (in Jiao Unit), imperf. ", 2c - 100c, cpl. 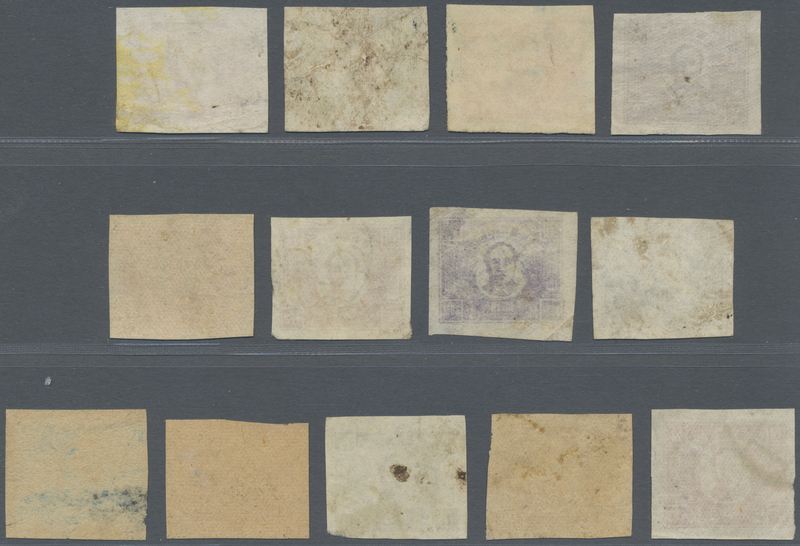 set of 6, additional block of 4 50c (newsprint paper), unused no gum as issued, plus 2 used samples (20c, 50c), fine to very fine (Yang NC187-192, NC188a). 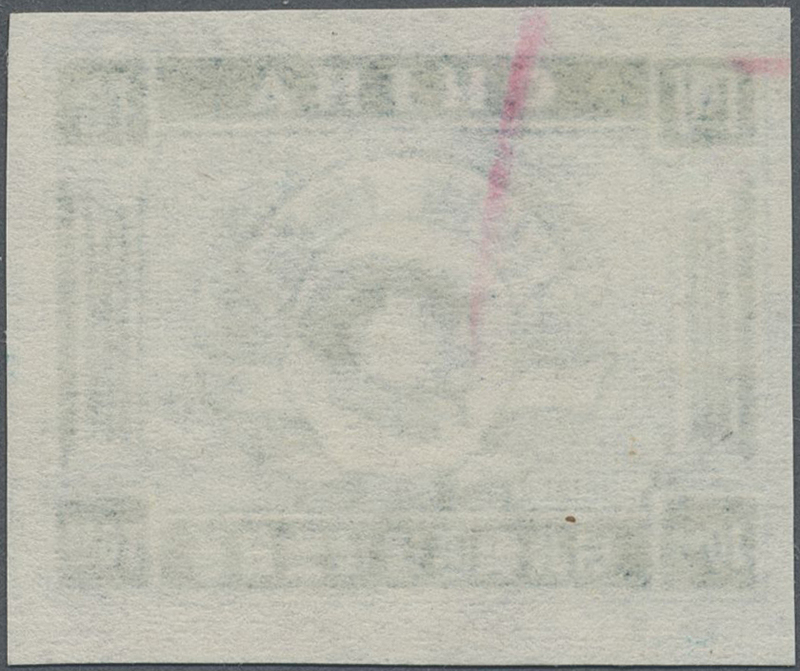 5040 ungebraucht ohne Gummi (unused without gum) (*) North China, Shanxi-Hebei-Shandong-Henan Border Region, 1946, "Eagle on Globe (in Jiao Unit), rouletted", 2c - 100c, cpl. 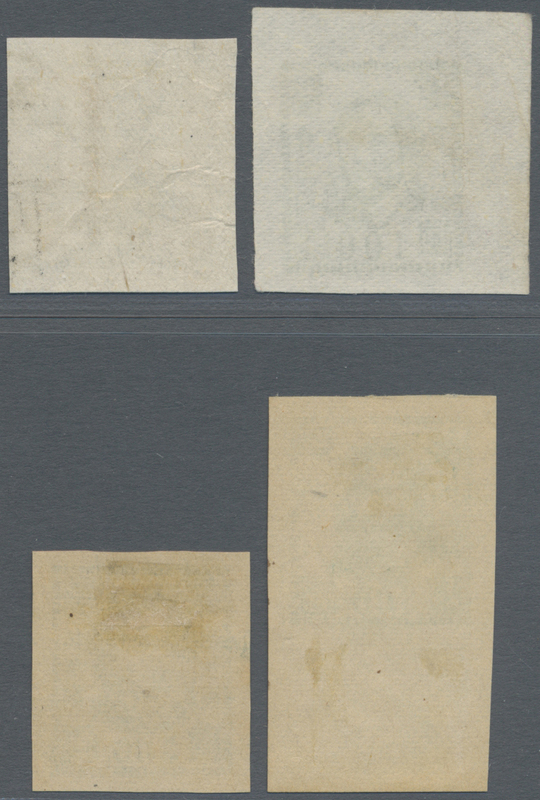 set of 6, additional 50c (newsprint paper), unused no gum as issued, very fine (Yang NC193-198, NC194a). 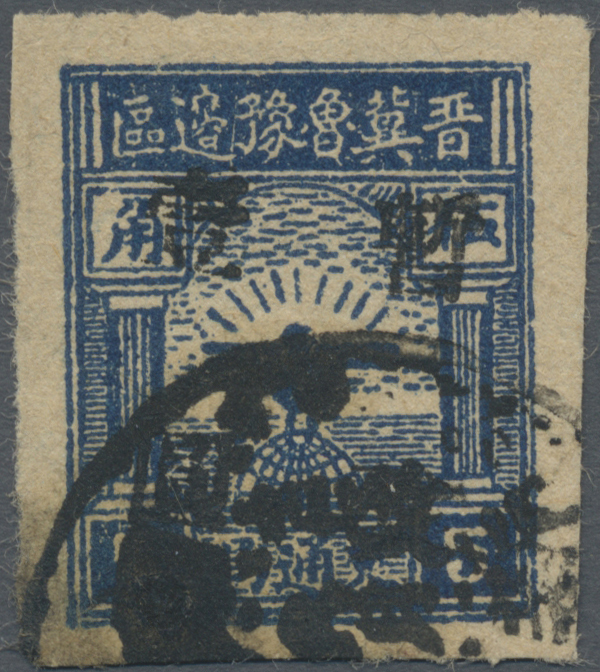 5041 ungebraucht ohne Gummi (unused without gum) (*) gestempelt (marked) 40 North China, Shanxi-Hebei-Shandong-Henan Border Region, 1946, "Eagle on Globe (Post Office)", $5, unused no gum as issued, small toning spot otherwise fine, additional one used copy, fine (Yang NC199). 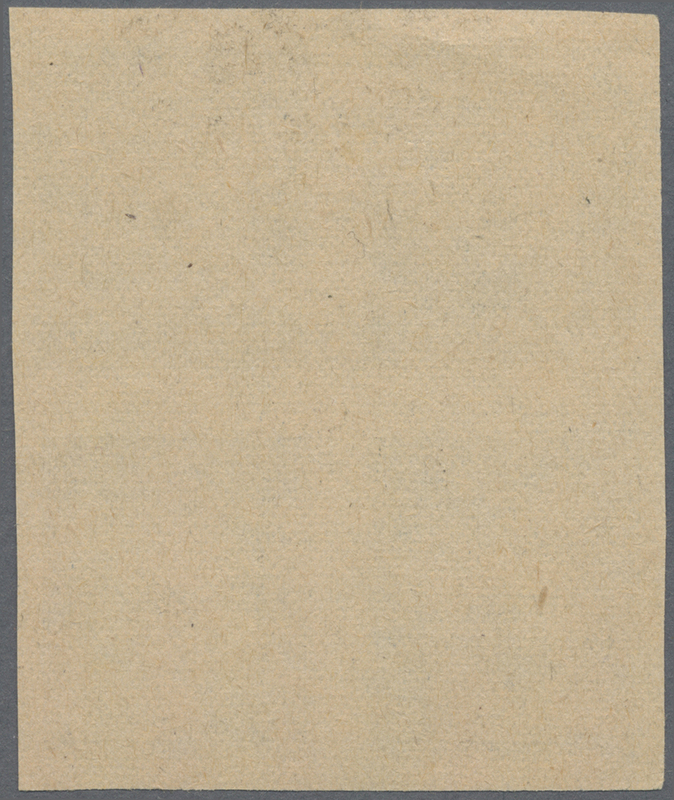 5042 ungebraucht ohne Gummi (unused without gum) (*) 4 North China, South Hebei District, 1946, "Eagle on Globe (in Jiao Unit) ovpt. 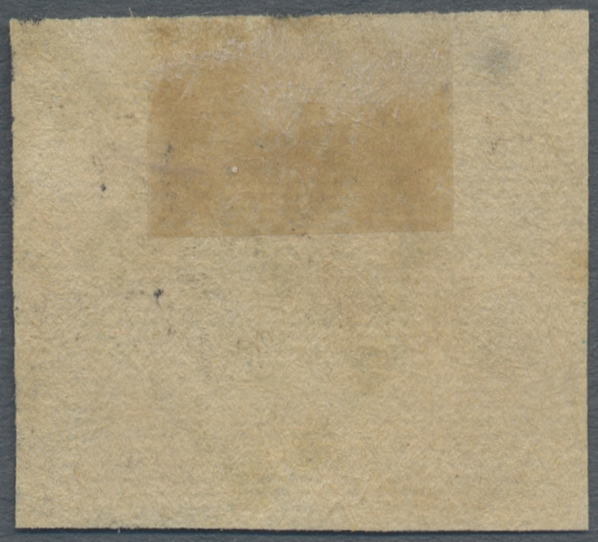 Temporarily Used for", $1/20c, unused no gum as issued, vertical crease (Yang NC200). 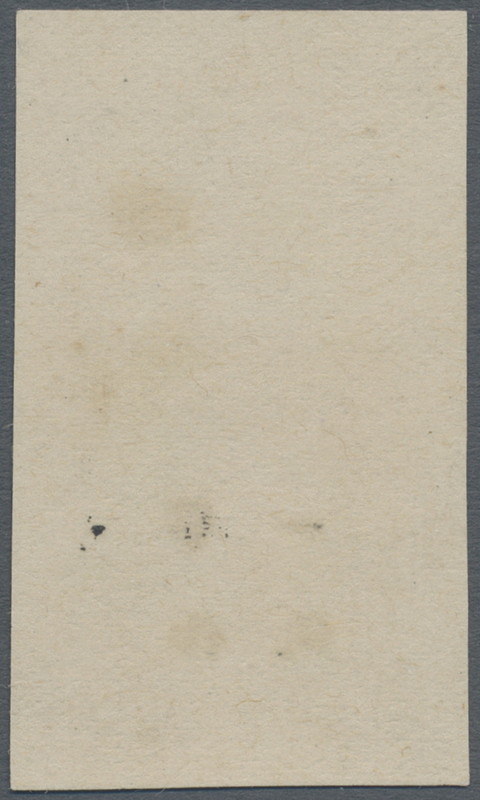 5043 gestempelt (marked) North China, South Hebei District, 1946, "Eagle on Globe (in Jiao Unit) ovpt. 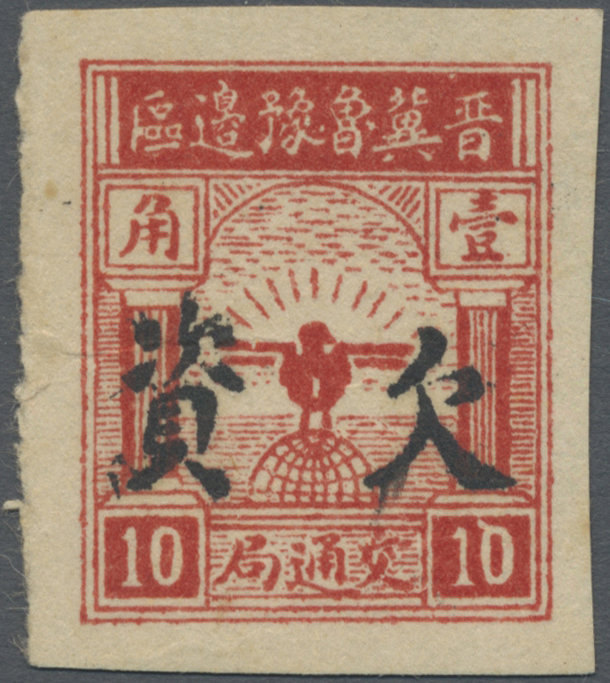 Temporarily Used for", $1/50c, used, very fine (Yang NC202). 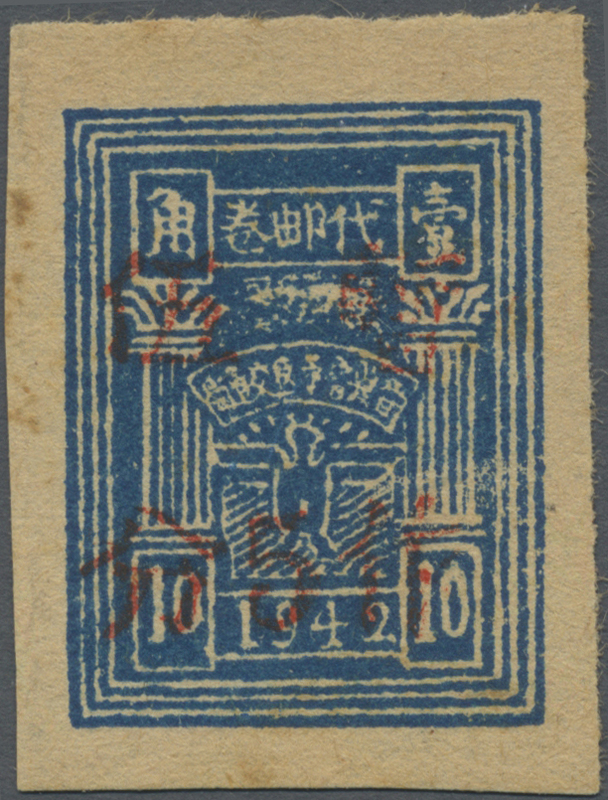 5044 gestempelt (marked) 5, 7 North China, Taihang District, 1946, "Eagle on Globe (in Jiao Unit) ovpt. 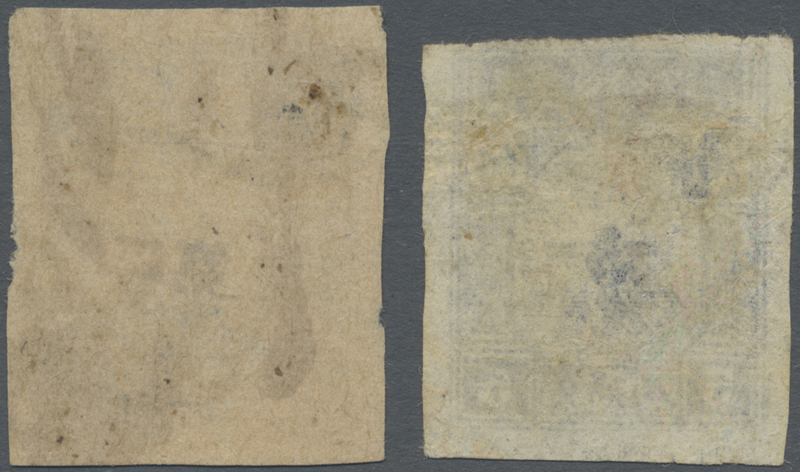 new value", $1/50c - $2/50c, $2/50c on newsprint paper (unlisted), used, fine to very fine (Yang NC211-212). 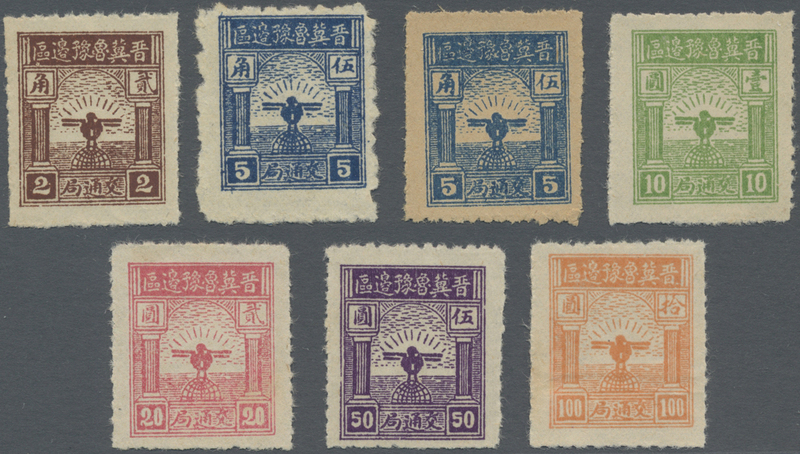 5045 ungebraucht ohne Gummi (unused without gum) (*) gestempelt (marked) 45-47, 50 North China, Shanxi-Hebei-Shandong-Henan Border Region, 1946-47, "Eagle on Globe (in Jiao Unit) ovpt. 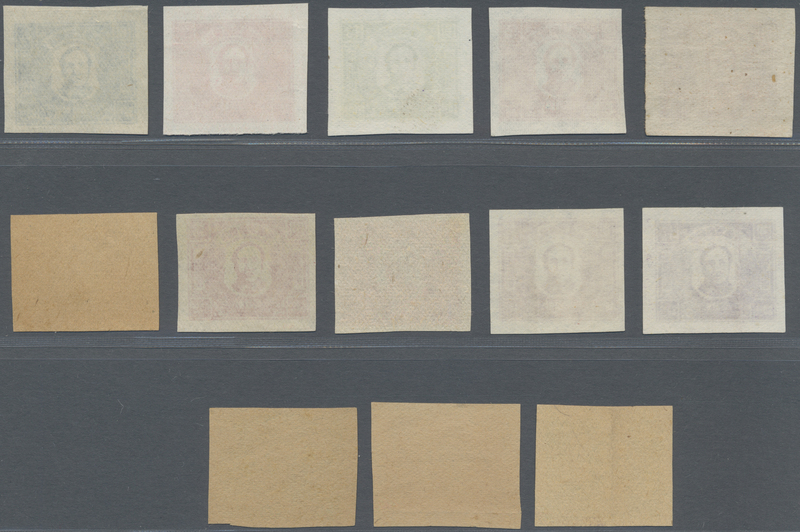 new value (large overprint)", the $1/50c, $10/$1, $20/$1 unused, $10/50c used, no gum as issued. 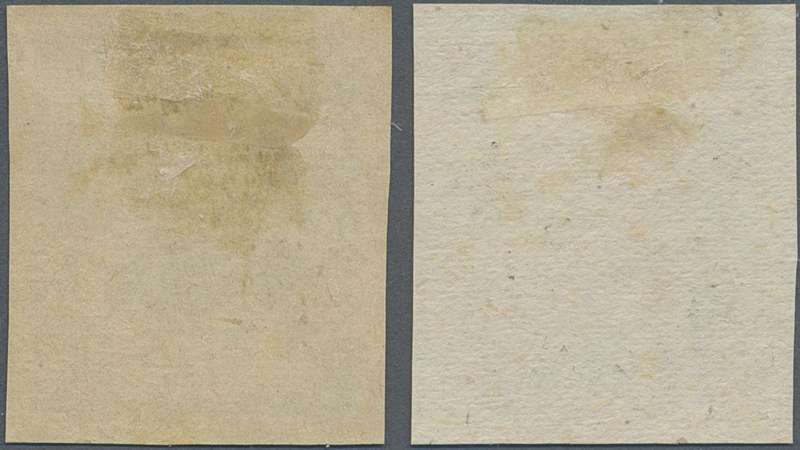 $1/50c vertical crease, otherwise fine to very fine (Yang NC214, NC216-217, NC219). 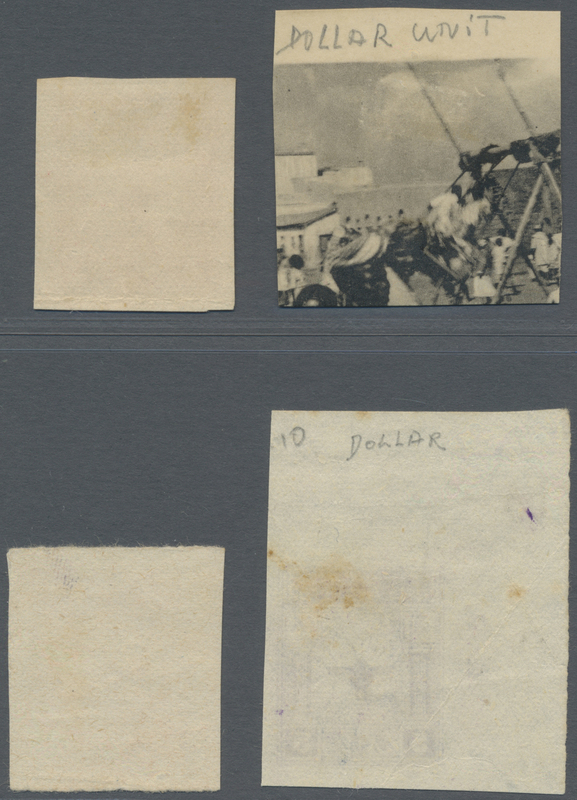 5046 ungebraucht ohne Gummi (unused without gum) (*) gestempelt (marked) 52-56 North China, Shanxi-Hebei-Shandong-Henan Border Region, 1946-47, "Eagle on Globe (in Jiao Unit) ovpt. 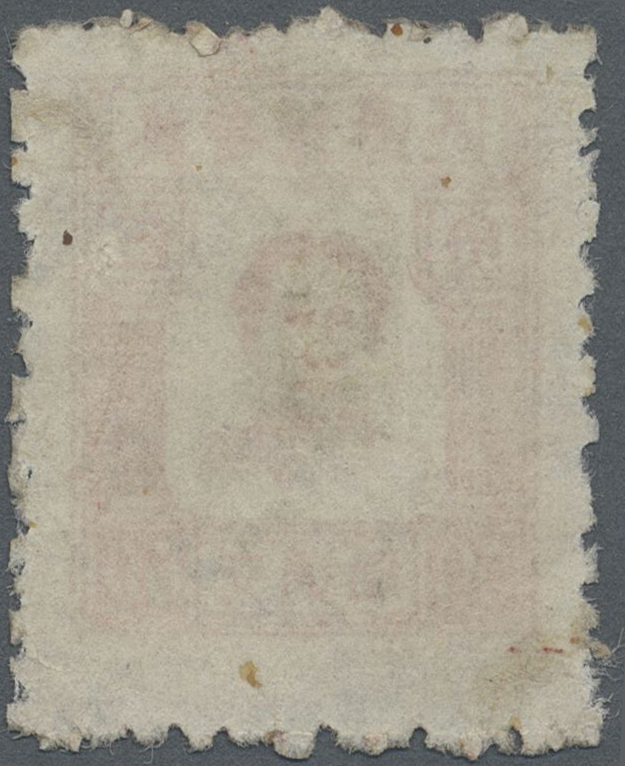 new value (small overprint)", $1/50c, - $30/50c, cpl. 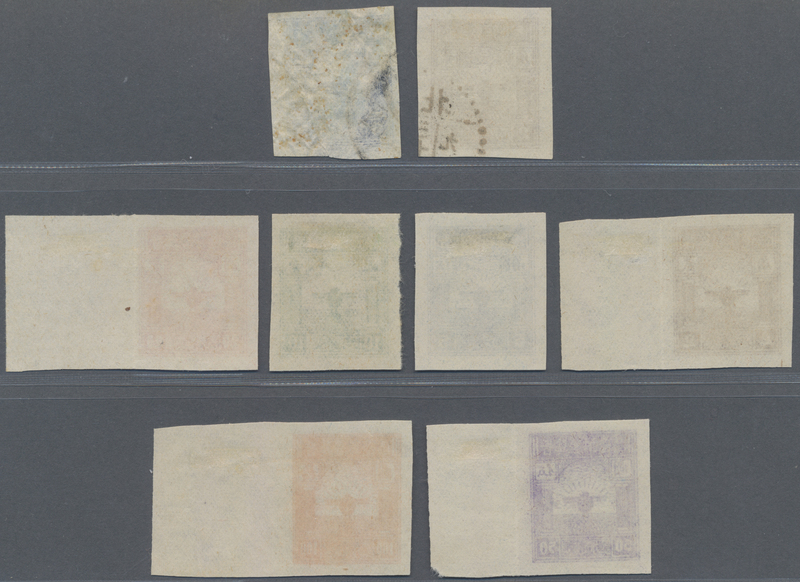 set of 5, $30/50c used, others unused no gum as issued, $1/50c small closed tear at top, otherwise very fine (Yang NC221-225). 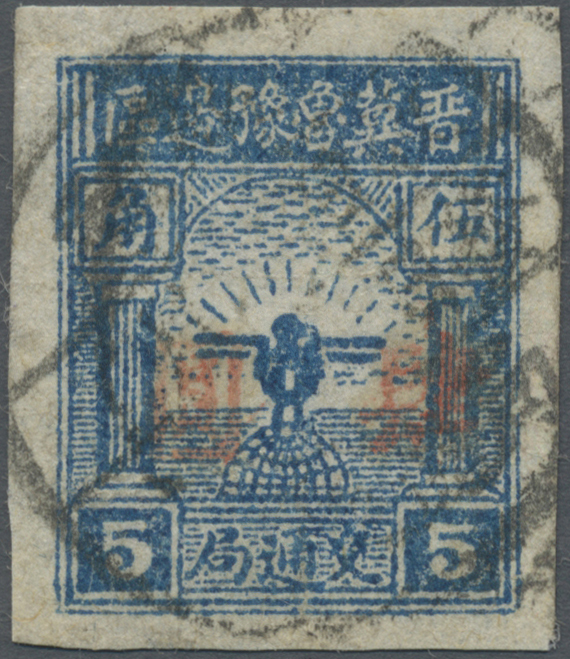 5047 gestempelt (marked) 8 North China, South Hebei District, 1946, "Eagle on Globe (in Jiao Unit) ovpt. 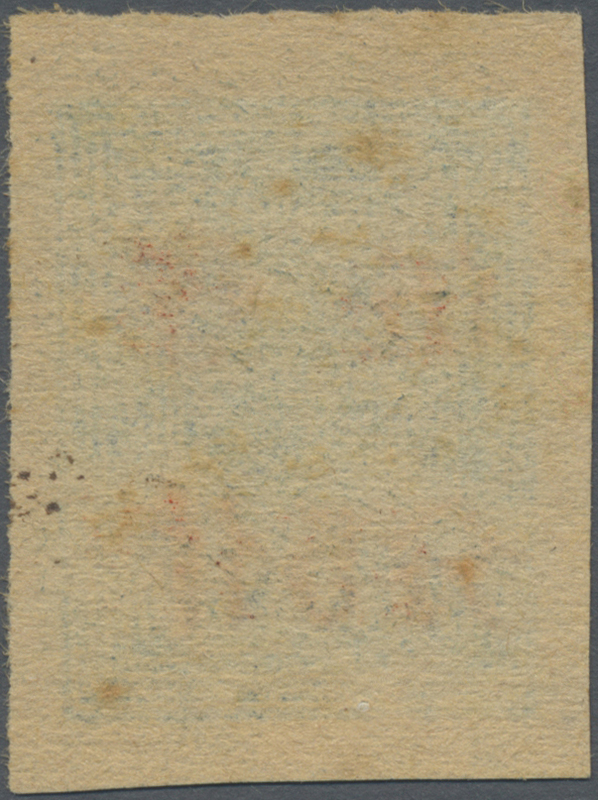 new value", $4/50c, used, very fine (Yang NC226). 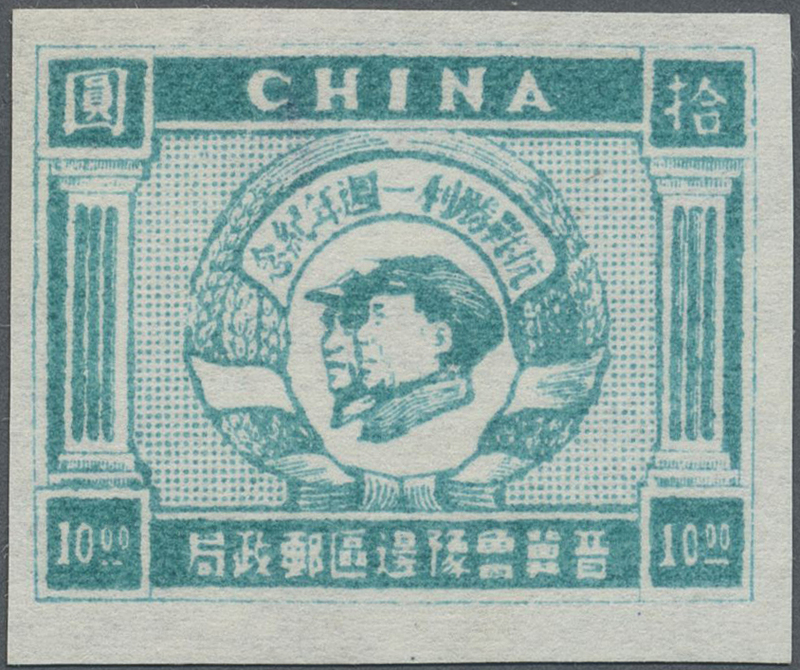 5048 ungebraucht ohne Gummi (unused without gum) (*) 70 North China, Shanxi-Hebei-Shandong-Henan Border Region, 1947, "1st Anniversary of Victory of War Against Japanese Aggression", $10, unused no gum as issued, small red stroke on reverse otherwise very fine (Yang NC227). 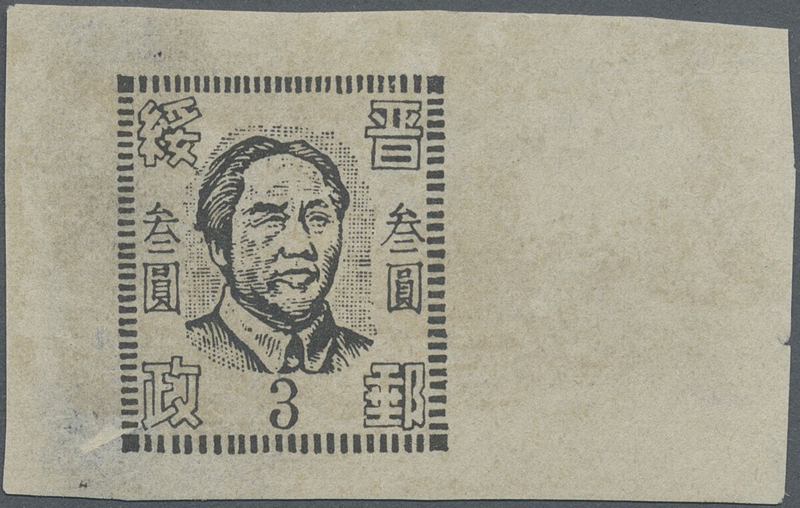 5049 ungebraucht ohne Gummi (unused without gum) (*) 57-69 North China, Shanxi-Hebei-Shandong-Henan Border Region, 1947, "Mao Zedong Issue (with bumper standing grains)", $2 - $500, cpl. 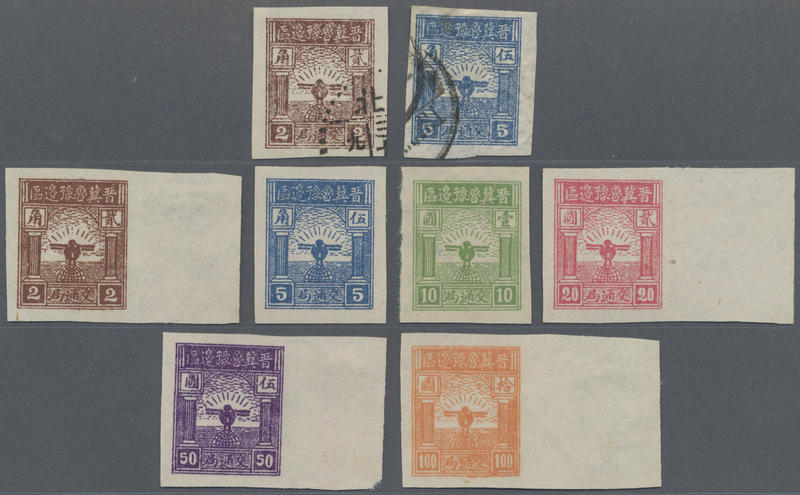 set of 13, unused no gum as issued, $30 (violet) and $40 with light vertical crease ,others fine to very fine (Yang NC228-240). 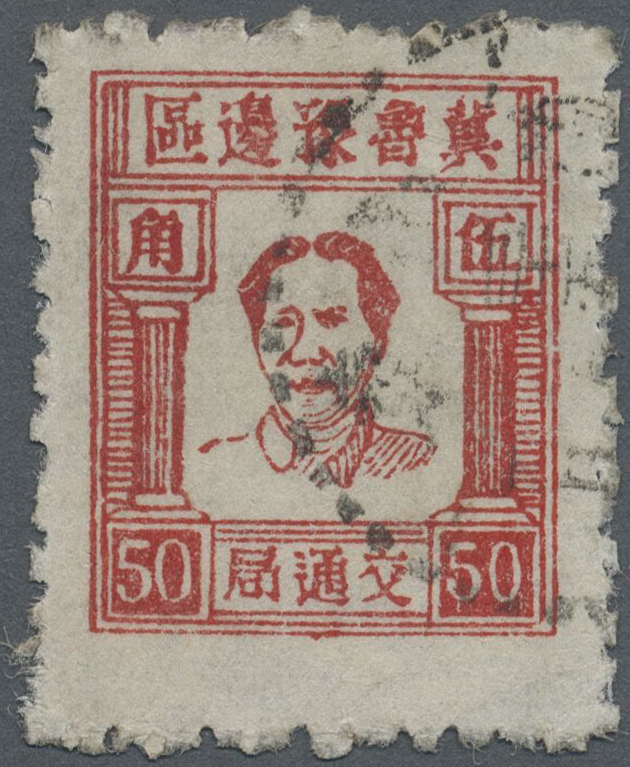 5050 gestempelt (marked) 57-69 North China, Shanxi-Hebei-Shandong-Henan Border Region, 1947, "Mao Zedong Issue (with bumper standing grains)", $2 - $500, cpl. 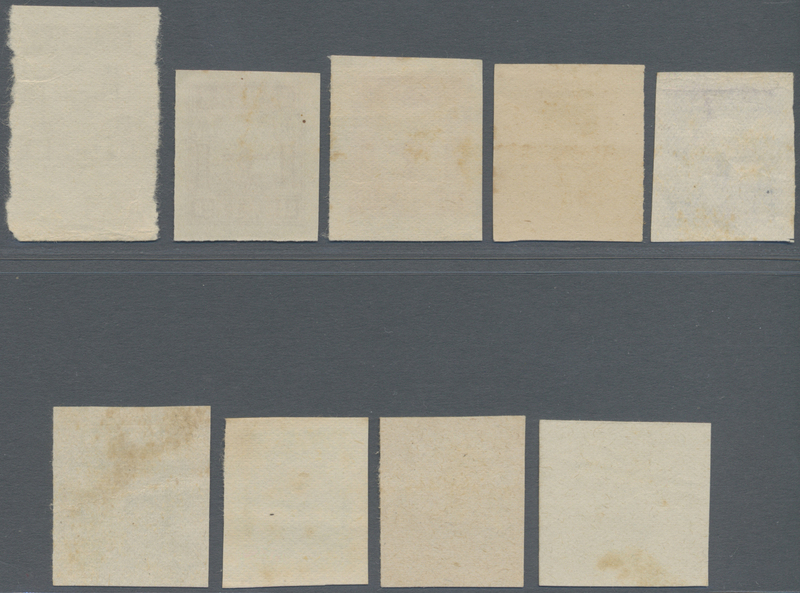 set of 13, used, some small faults otherwise fine to very fine, difficult to assemble (Yang NC228-240). 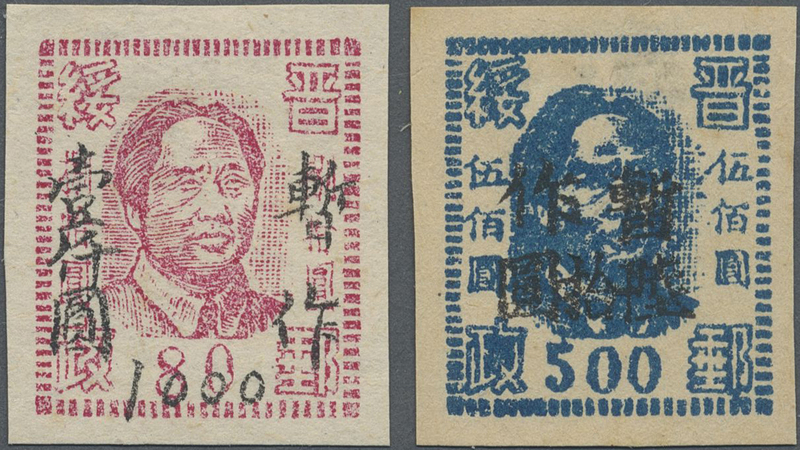 5051 gestempelt (marked) 59 North China, Shanxi-Hebei-Shandong-Henan Border Region, 1947, "Mao Zedong Issue (with bumper standing grains)", vertical pair $10 perforated, used, canc. 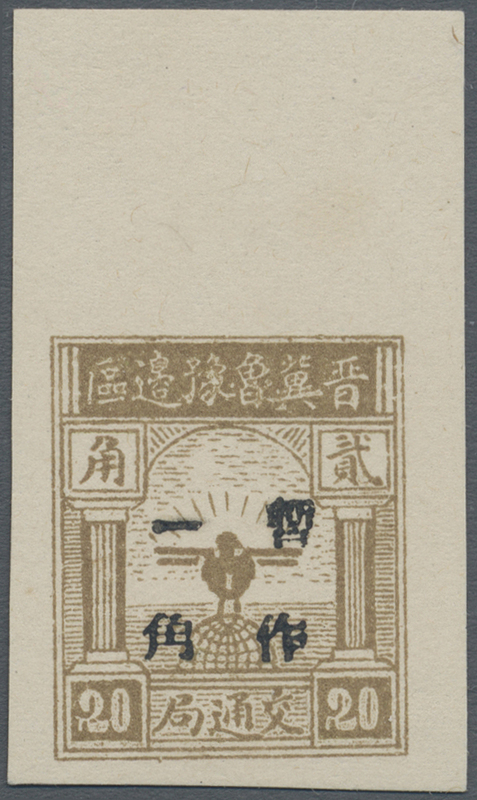 with a “Eagle on Globe type postmark, 4 March 1949” very fine (Yang NC230a). 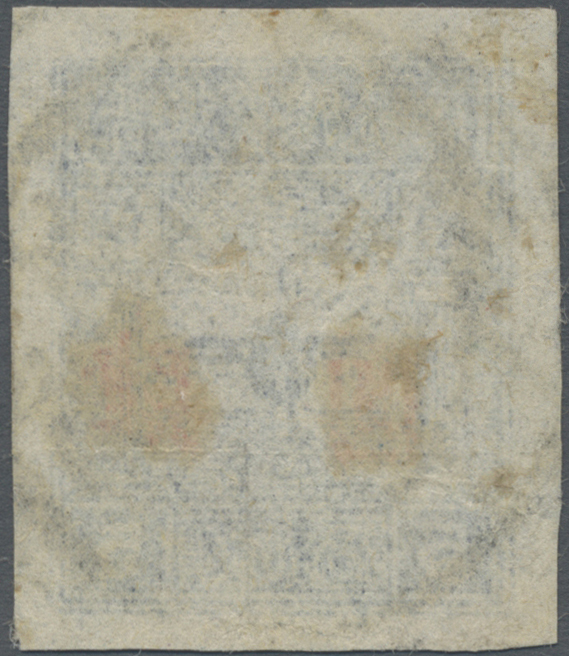 5052 ungebraucht ohne Gummi (unused without gum) (*) 66, 69 North China, Shanxi-Hebei-Shandong-Henan Border Region, 1947, "Mao Zedong Issue (with bumper standing grains)", $80 and $500 perforated, unused no gum as issued, $80 two vertical creases, $500 very fine (Yang NC237a, NC240a). 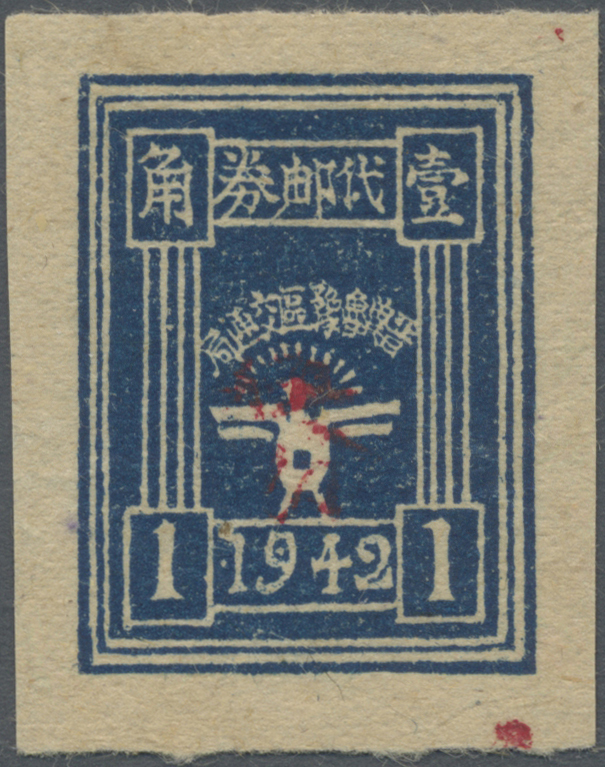 5053 gestempelt (marked) 71 North China, Shanxi-Hebei-Shandong-Henan Border Region, 1947, "2nd Anniversary of Victory of War Against Japanese Aggression", $20, lightly used, fine (Yang NC241). 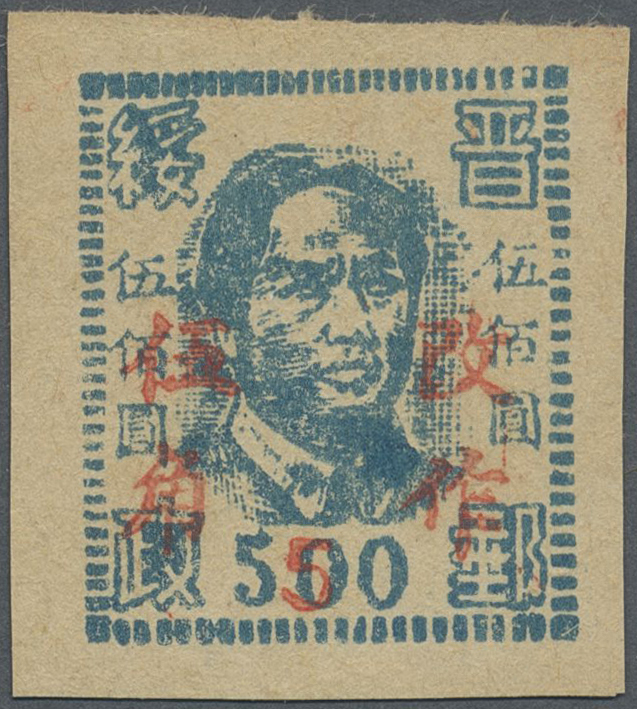 5054 gestempelt (marked) 1 North China, Hebei-Shandong-Henan District, 1945, "Mao Zedong Issue", 50c, used, very fine, vertical collar stripes type (Yang NC244). 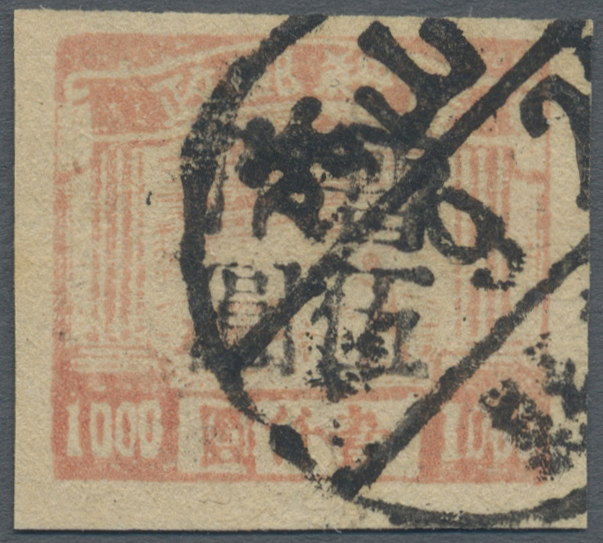 5055 gefälligkeitsgestempelt (complaisance-marked) 3 North China, Shanxi-Suiyuan Border Region, 1946, local mail non value stamp, nicely used (CTO), very fine (Yang NC248). 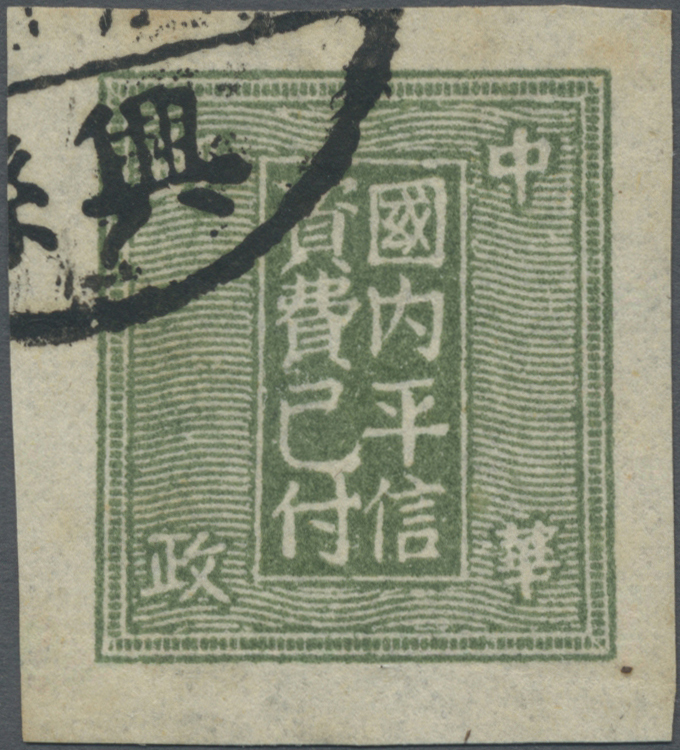 5056 Brief (cover) 5 North China, Shanxi-Suiyuan Border Region, 1946, double registered non value stamp, alongside Jinyu Lin County (???? ), Sanjiaozhen (??? 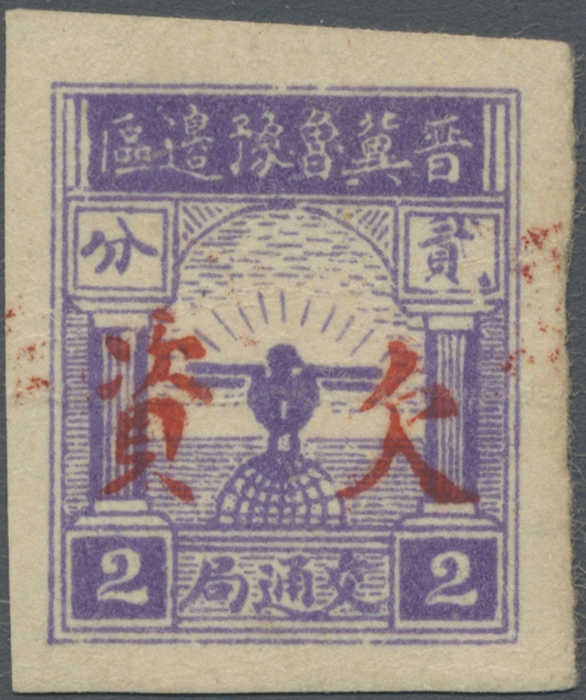 ), Liulin, Lüliang, Shanxi, red arrival postmark on reverse. Sent from Shanqingyucun, Lüliang (??????) to Gaoyangzhen, Xiaoyi (??????). 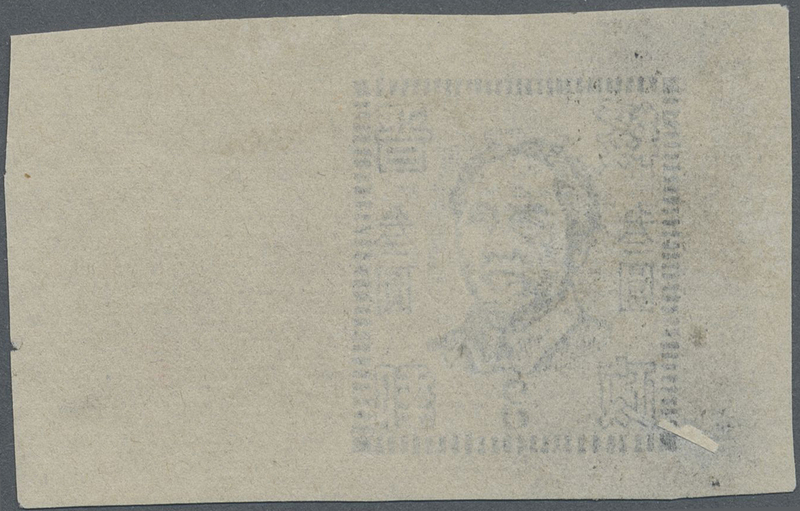 Faults (creases, tears) but absolutely negligible as this is the 2nd registered cover with the double registered unit stamp of the Shanxi-Suiyuan Border Region, an exhibition item of the highest rank (Yang NC252). 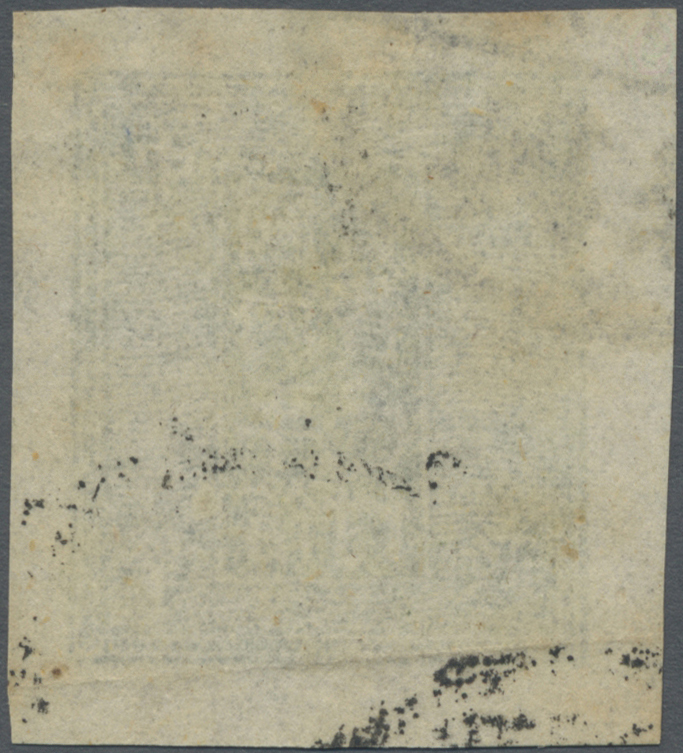 5057 ungebraucht ohne Gummi (unused without gum) (*) North China, Shanxi-Suiyuan Border Region, 1947, "1st Mao Zedong Issue" $3, black print in larger size on thin paper, unused no gum, probably proof, as is. 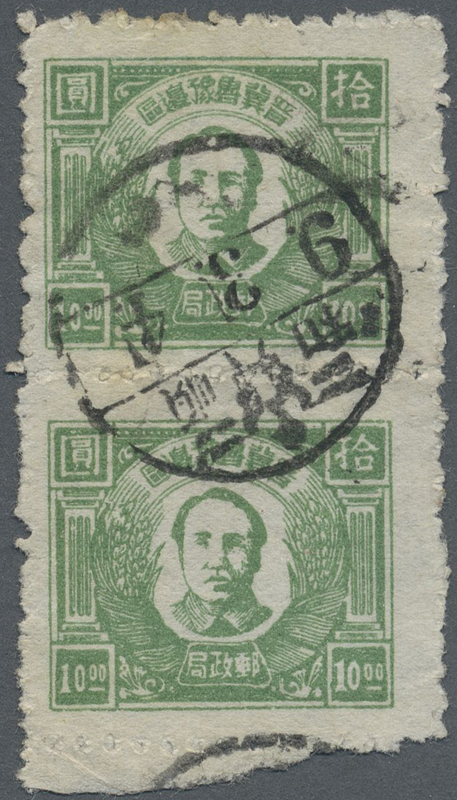 5058 ungebraucht ohne Gummi (unused without gum) (*) gestempelt (marked) 6-14, 32 North China, Shanxi-Suiyuan Border Region, 1947, "1st / 2nd Mao Zedong Issue", $1 - $500, cpl. 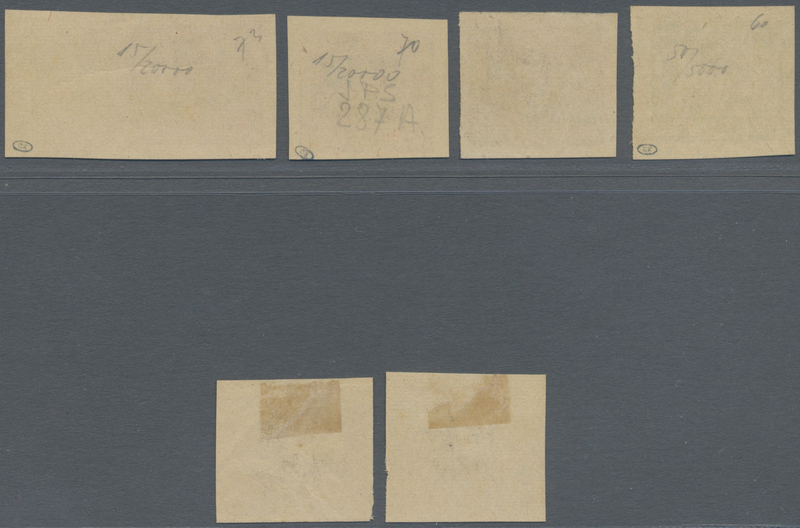 sets of 10 plus 3 copies ($80, $100, $500), used and unused no gum as issued, some faults (pinhole, crease, smudge) otherwise fine to very fine (Yang NC253-257, NC258a, NC259-261, NC275, NC275a). 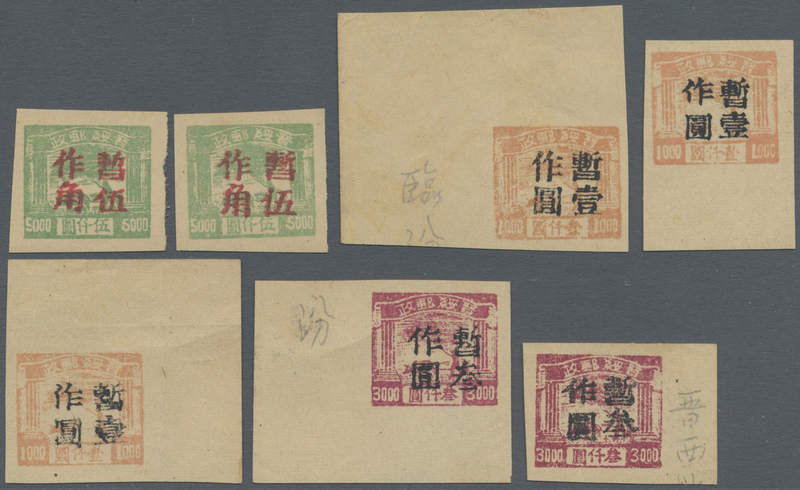 5059 gestempelt (marked) 16 North China, Shanxi-Suiyuan Border Region, 1947, "Temporarily Used For" ovpt., $500/$3, 2 copies, used, fine to very fine, used samples are rare (Yang NC263). 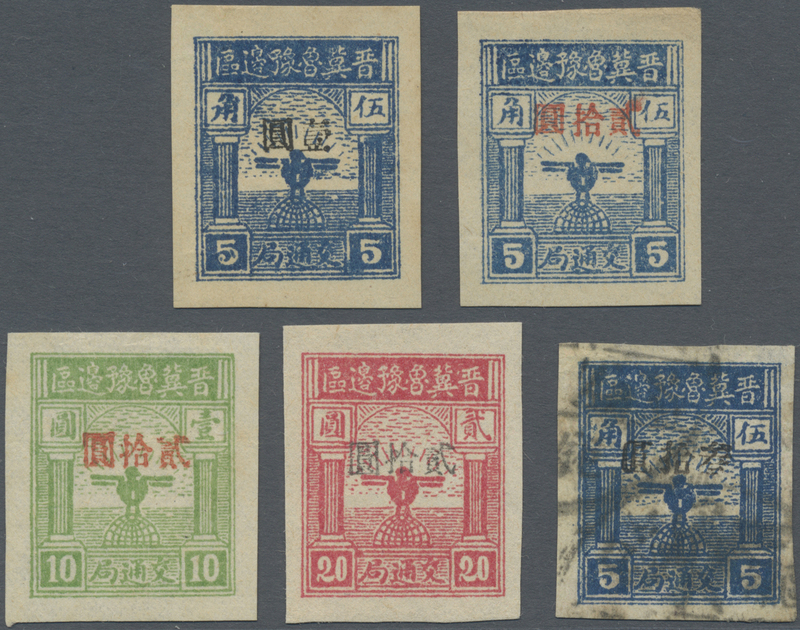 5060 ungebraucht ohne Gummi (unused without gum) (*) 18 North China, Shanxi-Suiyuan Border Region, 1948, "Temporarily Used For" ovpt., $500/$3, 2 copies, unused no gum as issued, fine to very fine (Yang NC265). 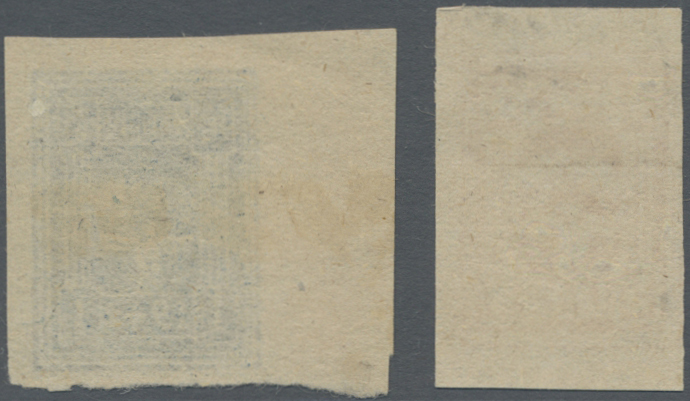 5061 ungebraucht ohne Gummi (unused without gum) (*) 20, 46 North China, Shanxi-Suiyuan Border Region, 1948/1949, "Temporarily Used For" ovpt., $1.000/$80, $60/$500, unused no gum as issued, mint hinge remnant, fine (Yang NC266, NC297). 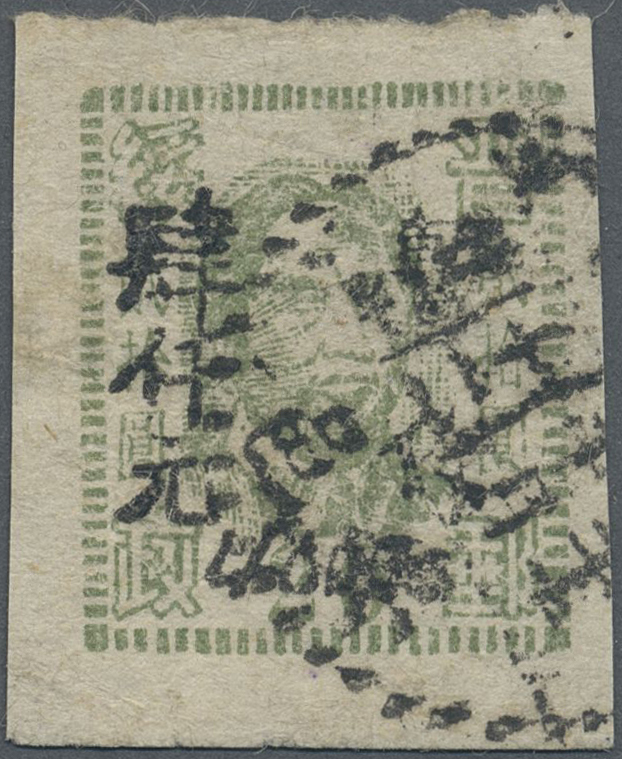 5062 gestempelt (marked) 27 North China, Shanxi-Suiyuan Border Region, 1948, "Temporarily Used For" ovpt., $4.000/$20, used, fine to very fine (Yang NC271). 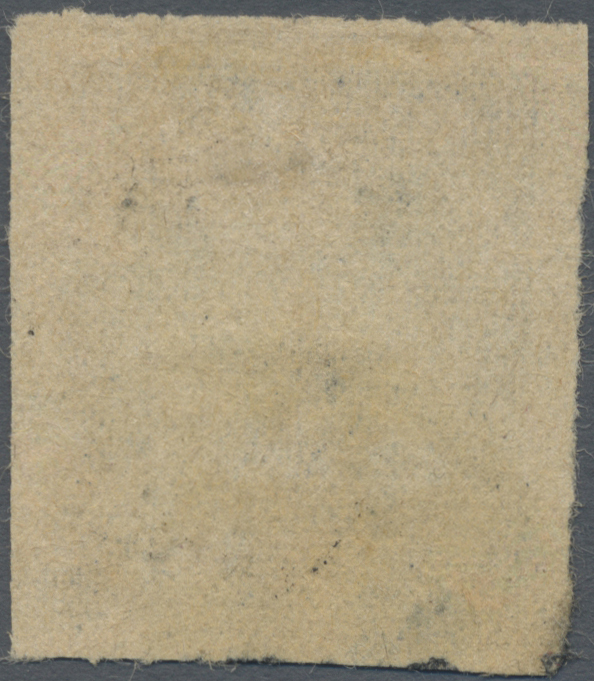 5063 ungebraucht ohne Gummi (unused without gum) (*) 33-37 North China, Shanxi-Suiyuan Border Region, 1948, "Ploughing Issue" ovpt., $1.000 - $20.000, cpl. 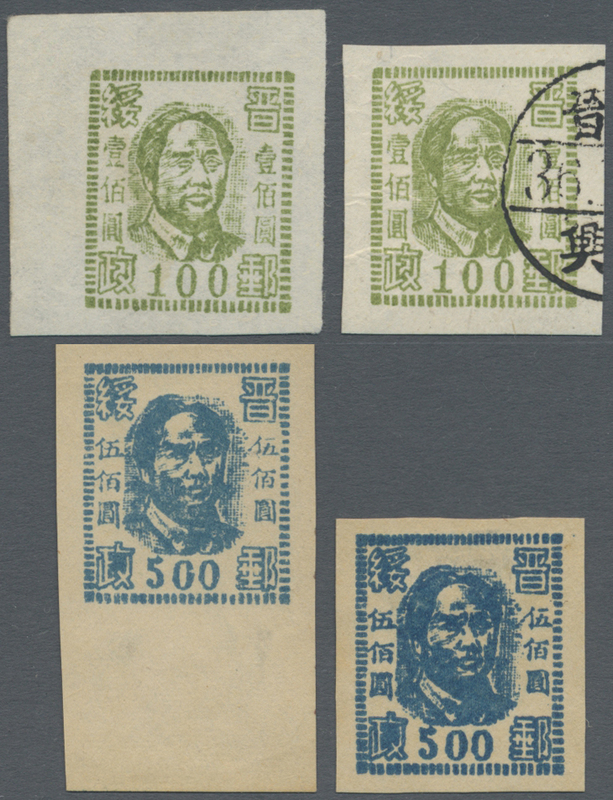 set of 3, unused no gum as issued, fine to very fine (Yang NC276-280). 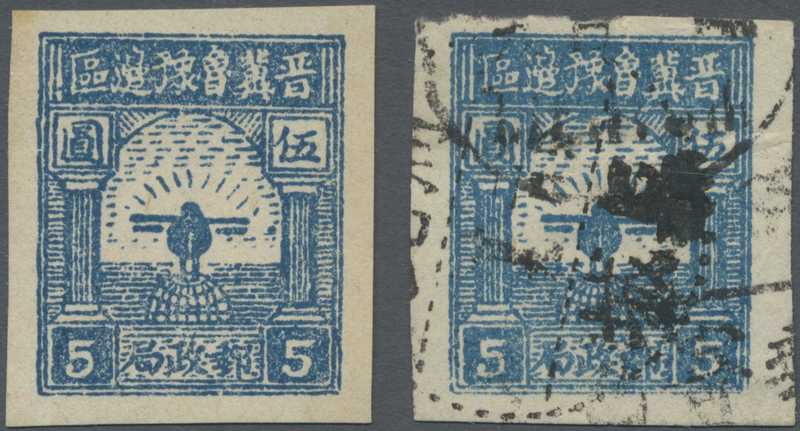 5064 gestempelt (marked) 39 North China, Shanxi-Suiyuan Border Region, 1948, "Temporarily Used For" ovpt., $5/$1.000, used, mint hinge remnant, fine to very fine (Yang NC282). 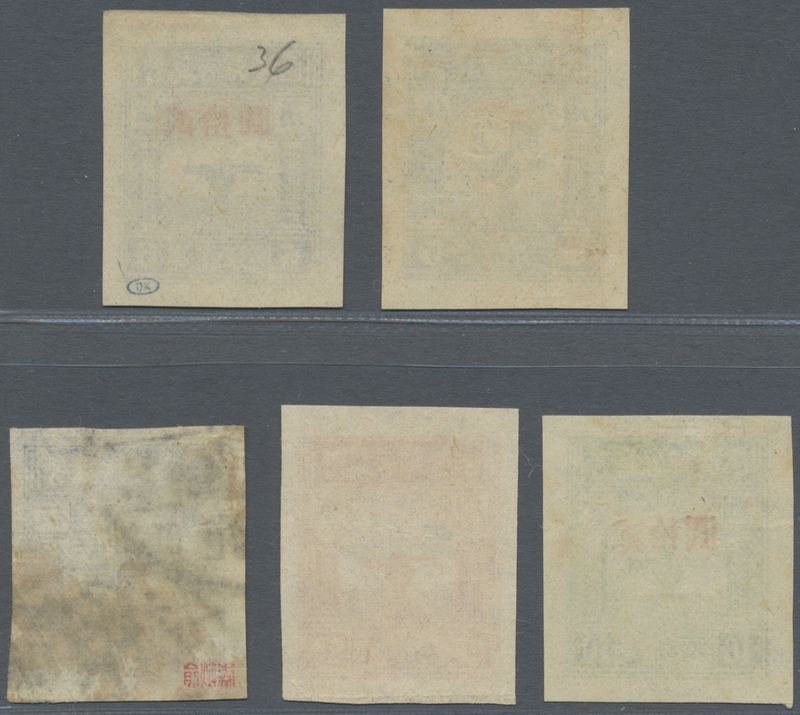 5065 ungebraucht ohne Gummi (unused without gum) (*) 40-45 North China, Shanxi-Suiyuan Border Region, 1948, "Temporarily Used For (first time)" ovpt., 50c/$5.000 - $15/$20.000, cpl. 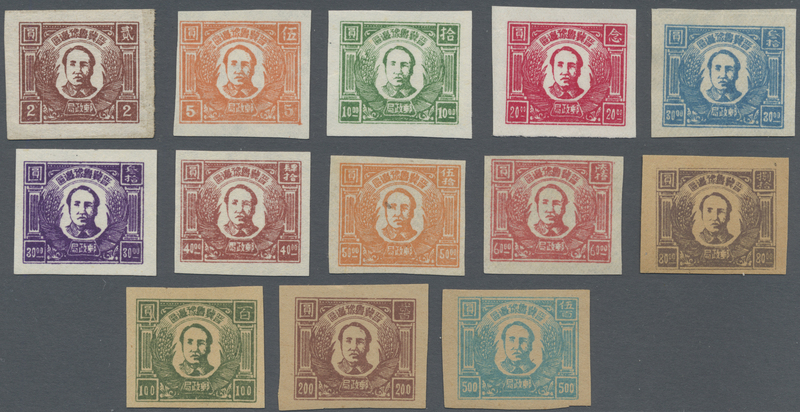 set of 6, many varieties, total 16 copies, unused no gum as issued, very fine, nice assembling (Yang NC283-288). 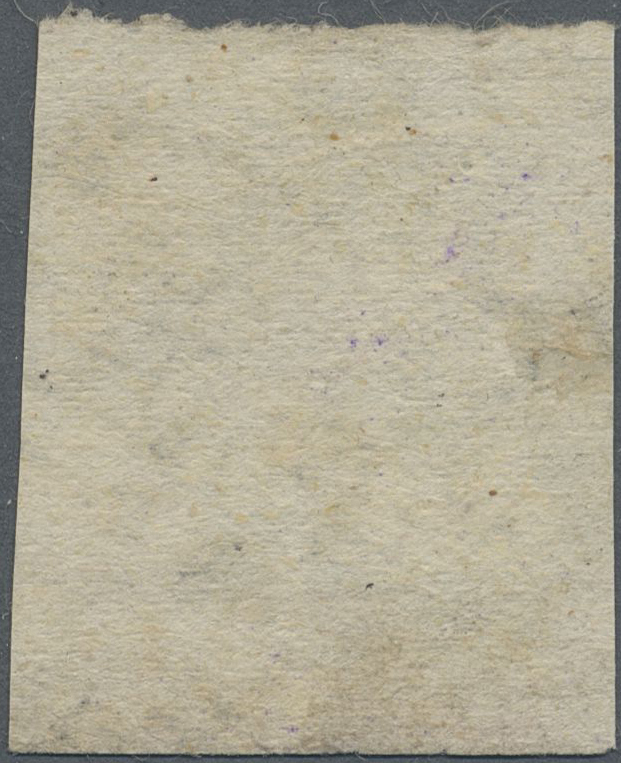 5066 ungebraucht ohne Gummi (unused without gum) (*) North China, Shanxi-Suiyuan Border Region, 1948, "Temporarily Used For" ovpt., $3/$3.000, horizontal pair, basic stamp printed on both sides, unused no gum as issued, very fine (Yang NC285a). 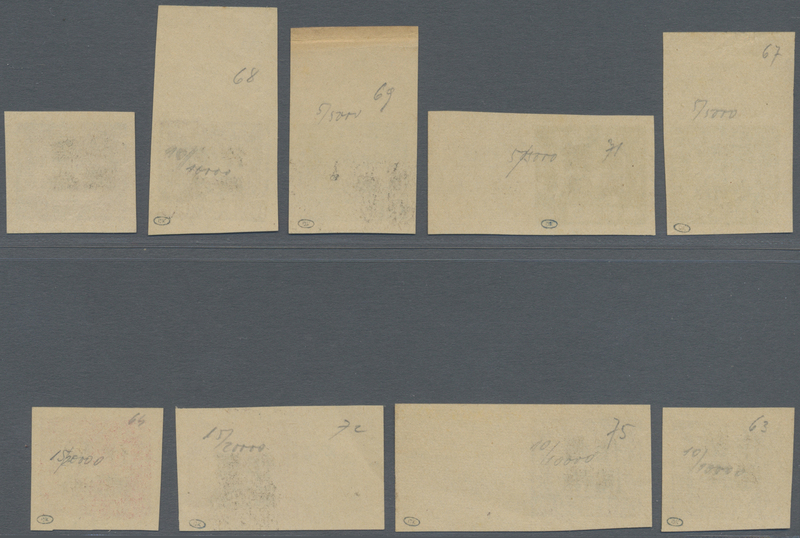 5067 ungebraucht ohne Gummi (unused without gum) (*) 47-51 North China, Shanxi-Suiyuan Border Region, 1948, "Temporarily Used For (second time)" ovpt., 50c/$5.000 - $100/$2.000, cpl. 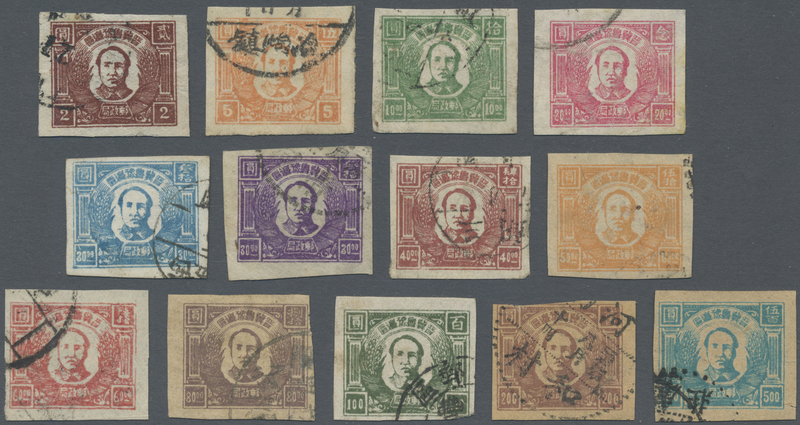 set of 8, some varieties, total 16 copies (inc. 2 used), unused no gum as issued, fine to very fine, nice assembling (Yang NC289-296, NC292a). 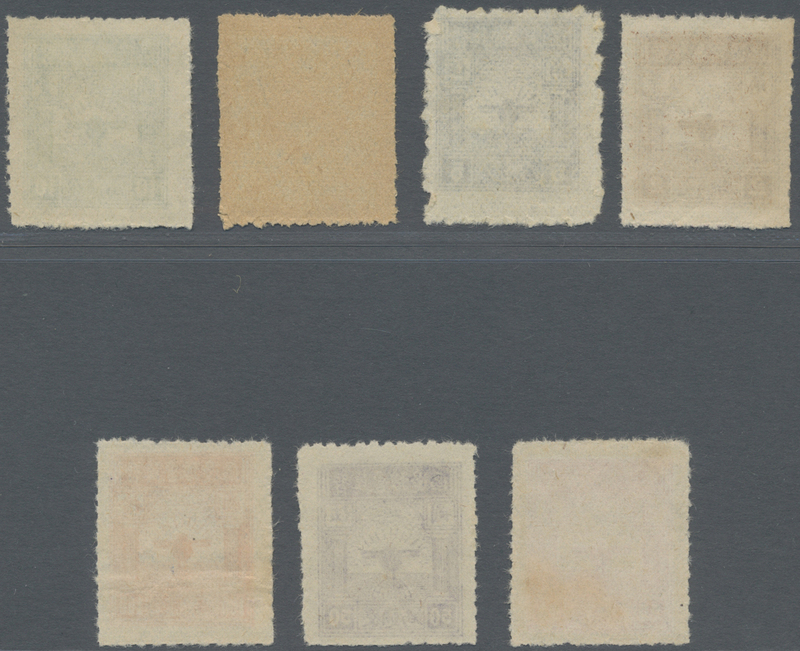 5068 ungebraucht ohne Gummi (unused without gum) (*) 1 North China, Suiyuan-Mongolia District, 1949, "Changed to" ovpt., 50c/$500, unused no gum as issued, very fine, a rare and highly sought stamp (Yang NC298). 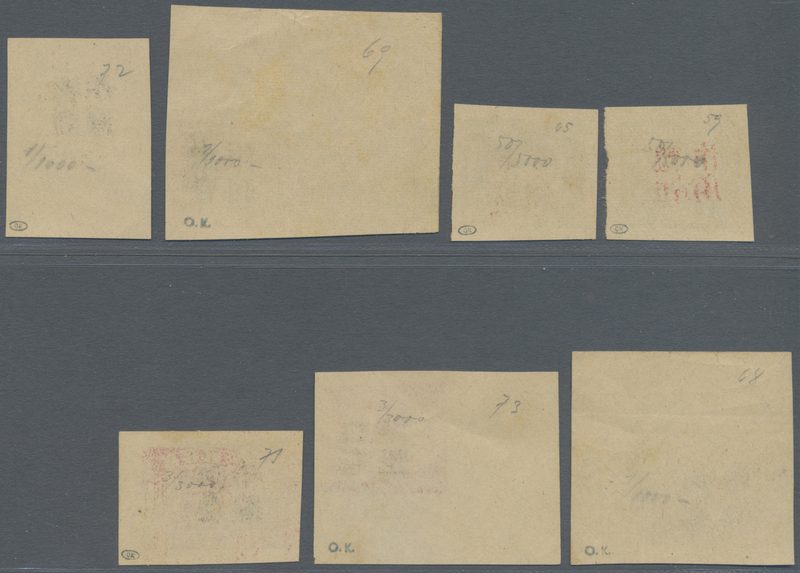 5069 ungebraucht ohne Gummi (unused without gum) (*) 2-5 North China, Suiyuan-Mongolia District, 1949, "Changed to" ovpt., $2/$3.000 - $15/20.000, unused no gum as issued, very fine, rare (Yang NC299-302). 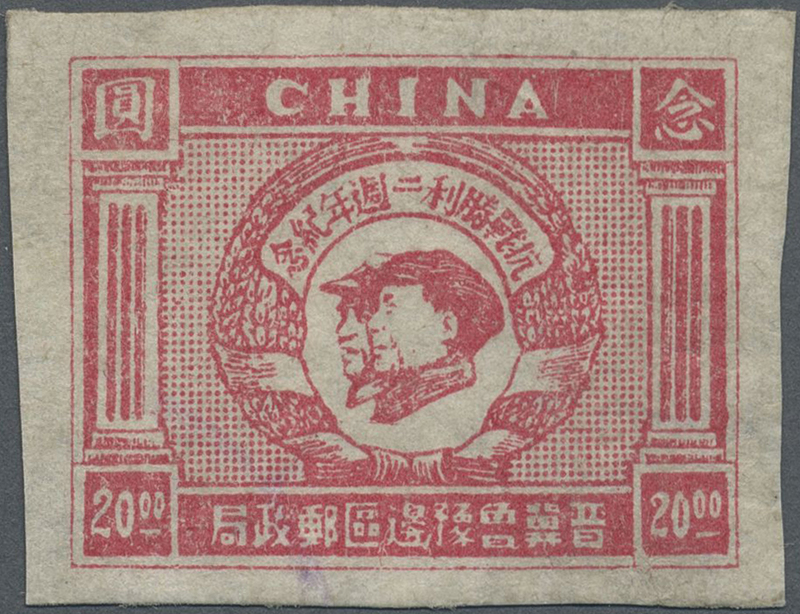 5070 ungebraucht ohne Gummi (unused without gum) (*) 1-3 North China, South Shanxi District, 1949, "South Shanxi People’s Post Used for" ovpt., $15/$20 - $200/$2, cpl. 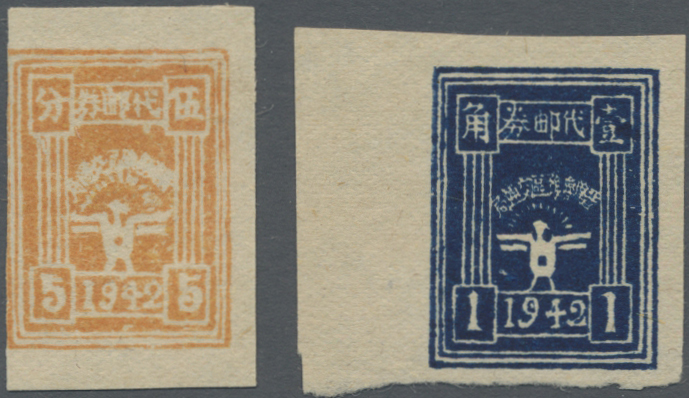 set of 3, unused no gum as issued, $15/$20, $50/$50 mint hinge remnant, fine to very fine (Yang NC303-305).